Applying concrete stain to a concrete floor is a great way to give you a professional, attractive, unique and finished floor at a very cost effective price. 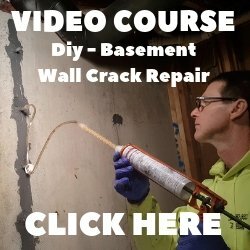 This page will introduce you to stained concrete, provide you with color charts, and also teach you how to stain concrete. I stain a lot of concrete floors. 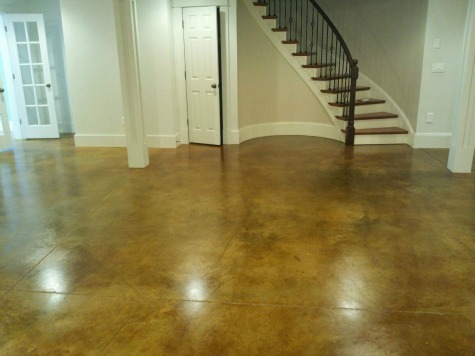 Here's a basement floor I stained using elite crete's hydro stone "leather tan" concrete stain. This was a 5 year old, regular looking grey concrete floor. I cleaned, stained, and sealed it, giving the owner a great looking floor. The stained concrete finish is a unique look limited only by the creativity of the installer and designer. Concrete being naturally porous and grey, gives you the perfect surface to stain. With all the different acid and water based concrete stains available, you're able to achieve a wide variety of vibrant and earth-toned colors like: brown, tan, blue and red. Staining your concrete floor, patio, pool deck or driveway can give you the custom look other materials don't offer. It's a great way to add color to concrete that's 1, 5, or even 10 years old. Acid stain works by penetrating into the surface of concrete and reacting chemically with the hydrated lime (calcium hydroxide) in the concrete. The acid in the stain etches the surface and allows the metallic salts to penetrate. After the stain reacts it becomes a permanent part of the concrete that doesn't fade or peel off. Click on CONCRETE ACID STAIN to learn more about this process. Acid stains are translucent and the color will vary depending on the condition of the concrete. Every concrete slab will absorb the stain differently. That's what makes it unique. The different color variations give the concrete a distinct look creating amazing color variations that give it character. Acid stains come in a limited amount of colors, mostly earthy tones. Here is an acid stain color chart that shows some examples. There are some newer products on the market like water based stains and CONCRETE DYE that offer a whole new range of colors to choose from. 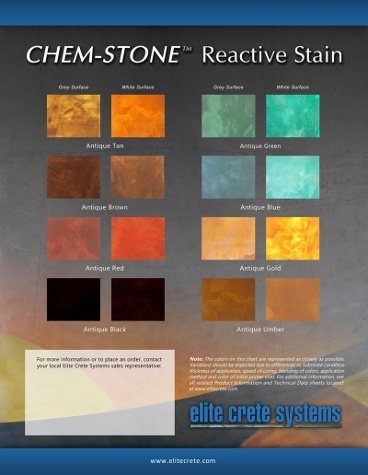 Here is a color chart for elite crete's concrete dye stain that I use. This type of stain offers you a wider range of colors to choose from. See my 10 tips for ACID STAINING CONCRETE floors. Click here to learn about the CONCRETE SURFACE PREPARATION before you decide to stain. 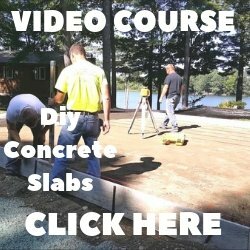 Click here to learn about HOW TO STAIN CONCRETE getting the concrete ready. Click here to learn HOW TO STAIN CONCRETE FLOORS applying the stain. Click here to learn HOW TO SEAL ACID STAINED CONCRETE applying the sealer. Click here to learn what kind of CONCRETE SEALER to use on your stained floor to protect it. Click on BEHR CONCRETE FLOOR STAIN to learn about this type of non-acid stain.